In honor of Veterans Day, Ancestry.com offered free searches of military databases. As I perused a World War I database, I noticed many soldiers were buried at Brookwood American Cemetery in England. Why England, and not France? A few reasons occurred to me. They may have been victims of the Spanish Flu epidemic. Or they may have been wounded in France and transferred to a hospital in England. Many of the deceased had a code in their entry: SARD CAC Screven. I googled the phrase. It stands for September Automatic Replacement Draft, Coastal Artillery Corps, Fort Screven, Georgia. Three draft registrations took place for World War I. The first was June 5, 1917; the second, June 5, 1918; the third, September 12, 1918. Many Georgia farm boys reported to Fort Screven after the last draft. They set sail for Great Britain on September 25, 1918, aboard HMS Otranto in Convoy HX-50. 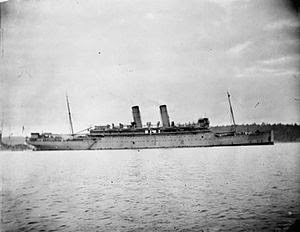 The Otranto was a luxury line pressed into service as a troopship. It had launched in 1909 and spent much of its nine years carrying passengers between England and Australia. Captain Ernest Davidson commanded the ship, and in deference to his experience and ability, he was appointed as commodore of the convoy. Including the British crew, 1,083 men were aboard the Otranto. Trouble quickly plagued the convoy’s voyage. Strong winds, poor visibility, and heavy seas forced them to reduce speed. Seasickness felled most of the men. Influenza also spread among them. Late on October 1st, the blacked-out ships crossed paths with a fleet of French fishing boats. The Otranto rammed the Croisine. Captain Davidson sent the rest of the convoy on while he stopped to rescue the fishermen, turning on a spotlight despite the risk of a German U-boat spotted them. Thirty-seven Frenchmen joined them, and they raced after the convoy. Hurricane-force winds whipped up the sea as the convoy approached the entrance to the North Channel between Northern Ireland and Scotland. The formation was scattered and they did not know how far they’d been blown off course. On Sunday morning, October 6, high, rocky land was spotted ahead and to their left. Were they seeing the western coast of Scotland or the northern coast of Ireland? Most vessels correctly identified Scotland and turned south. Aboard the Otranto, Captain Davidson had just gone for a quick breakfast. The officer on watch thought he saw Ireland and turned north. Directly into the path of the Kashmir, a former Royal Mail Ship with limited passenger accommodation pressed into war duty. Riding a massive fifty-foot wave, the Kashmir knifed into the Otranto. Wave action plunged it in deeper and then pulled it back out. Per wartime regulations, the Kashmir left the Otranto dead in the water, a gaping hole in its side, and scores of dead soldiers and sailors. Otranto had few options. The steering was out. The waves and wind prevented launching the lifeboats. Damaged bulkheads collapsed, eliminating any hope of restarting the engines. Captain Davidson hoped they would drift toward shore and beach. The British destroyer HMS Mounsey was out searching for ships of the convoy and spotted the Otranto. Commanding officer Lt. Francis Craven maneuvered alongside the much larger ship so the men might jump onto the destroyer. Waves took them apart and slammed them back together. On a calm day, the Mounsey’s deck would be 30’ below the Otranto’s. In the storm it rose to a level height and then dropped 60’ down. The men lined the rail of the Otranto and jumped. Some landed aboard the Mounsey, others dropped into the water and were crushed between the ships when they slammed together. Some landed on the Mounsey only to be swept overboard, or they landed on equipment and were badly injured. Others refused to jump, believing the Otranto to be safer. Coming alongside eight or nine, the Mounsey suffered serious damage in its rescue efforts. It also became overloaded. Lt. Craven had to leave the rest and head for port in Belfast. Survivors were cold, wet, sick, numbed by horror, and had to endure a perilous 8½ hour journey. Five hundred nine-seven men were saved by the Mounsey: 300 American soldiers, 266 Otranto sailors, thirty French fishermen, and an American YMCA man. Nearly five hundred men were left aboard the Otranto. Most of the Americans had never seen the ocean before their voyage. Few knew how to swim. Unlike the sailors, they didn’t know how to time the rise and fall of the Mounsey. Half an hour after the destroyer left, the Otranto landed on a reef three quarters of a mile offshore of the island Islay (pronounced Eye-la). Waves lifted the ship and dropped it back down, breaking it into pieces. Only twenty-one men managed to swim through the storm-tossed, debris-filled waves and come ashore in one of the crevices among the rocky cliffs. (Two later died of injuries.) Others were slammed against the rocks or drowned. 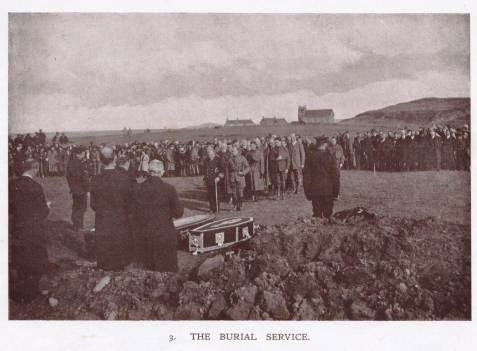 1918 Funeral Service for Victims of the Otranto Disaster, Island of Islay, Scotland. The islanders said the storm was the most violent they could remember. By the next morning, the Otranto had been torn completely apart. Wreckage heaped up fifteen feet among the rocks for three miles. Islanders searched for survivors, but found only hundreds of battered bodies. The War Department put American loses in the disaster at 357 out of 694. Based on their families’ preferences, some were sent home for burial. Others lie in the American Cemetery at Brookwood, Surrey, England. Less than two months later, the war ended. 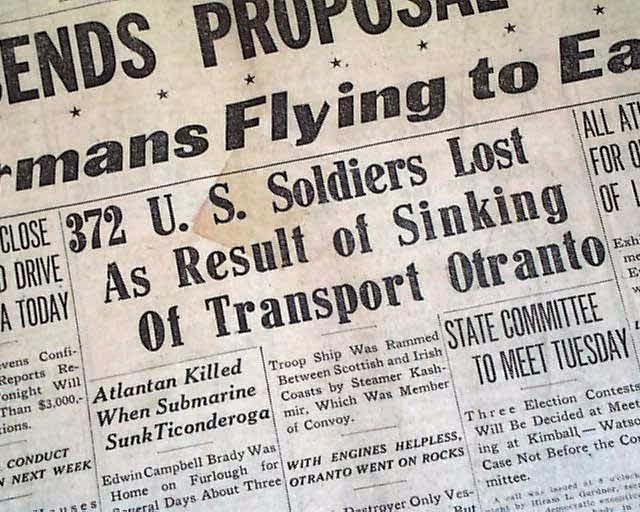 Ninety-seven years ago today, they died in a war they hadn’t been needed for. 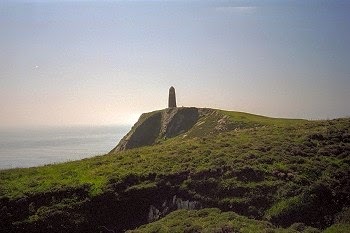 In 1920 the American National Red Cross erected the American Monument on the Mull of Oa in memory of those who died when the Tuscania (torpedoed by a U-boat eight months earlier) and the Otranto sank. Yikes what a horrendous ordeal to go through!! Very interesting post - now that I have time to read it! And they weren't even needed. It was bad enough, but somehow, that fact seems to make it worse.